The Sustainable NanoTechnology and NanoHealth Symposium on April 30, 2014, gathered over 70 researchers and practitioners in the health sciences, engineering, policy and law to examine and discuss the effects of using nanotechology in research and industry. The symposium articulated the need to better understand the potential health and environmental risks of nanoproducts, develop risk assessment and management tools and strategies, and engage with consumers and stakeholders about potential hazards through online media. The event, held at the University of Maryland, College Park, was spearheaded by Dr. Donald Milton, director of the Maryland Institute for Applied Environmental Health in the University of Maryland School of Public Health, along with a planning committee of experts from the College Park and Baltimore campuses of University of Maryland and Harvard University. Dr. Philip Demokritou, director of the Harvard Center for Nanotechnology and Nanotoxicology, and Dr. Sally Tinkle, senior strategy and policy manager at the Science and Technology Policy Institute, were featured speakers. Dr. Patrick O'Shea, vice president of research for the University of Maryland, and Dr. Jane Clark, dean of the UMD School of Public Health welcomed symposium participants, who included scientists from the National Institutes of Health, the Food and Drug Administration (FDA) and the Consumer Product Safety Commission (CPSC), in addition to University of Maryland scientists. Dr. Demokritou's keynote emphasized how little information exists on the health and safety of consumer exposure to engineered nanomaterials. Focusing on policy and regulation, Dr. Tinkle discussed the challenge of creating sustainable nanotechnology governance, and underlined the need to better curate, store, and share data with researchers and the public. The symposium featured a panel on federal research and funding, and breakout discussions on nanotechnology exposure science and risk assessment, materials synthesis to develop sustainable nanotechnology and nanomedicine, and predictive nanotoxicology using in vitro models and in vivo studies. 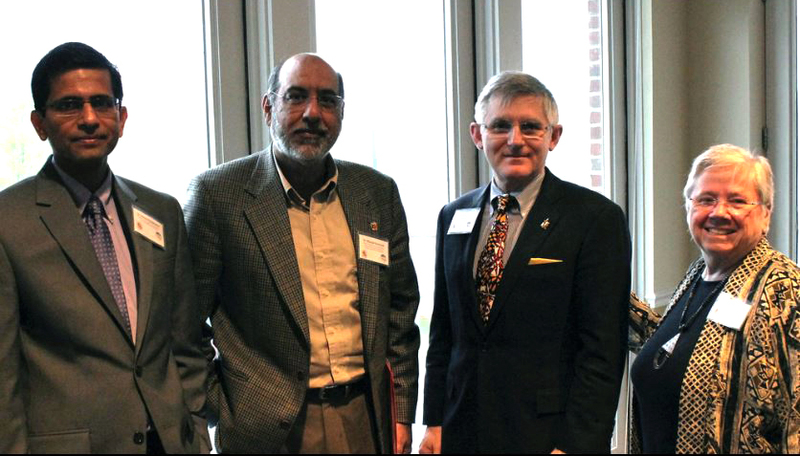 In addition to raising awareness about the risks of nanotechnology, the goal of the symposium was to bring together physical and life scientists to catalyze research collaborations, as well as to begin the development of a strategic vision for how UMD can play a more active role in filling the gaps of information on nanotechnology's impact on environmental and human health. In addition to Dr. Milton, symposium organizers included: Zhihong Nie, PhD, Assistant Professor of Chemistry (UMD); Sanjay Rajagopalan, MD; Melvin Sharoky, Professor in Cardiovascular Medicine (UMB); and Michael Zachariah, PhD, Professor, Chemical and Biomolecular Engineering, and Chemistry and Biochemistry (UMD). Pictured (left to right): Sanjay Rajagopalan, Michael Zachariah, Patrick O'Shea and Jane E. Clark.